I have owned this supply for a couple of years now and I have been very happy with it. These units are made by Manson and are branded under many different names. I have the one branded by Rapid Electronics, model number PS1540S. They are most commonly known by the model number SPS-9400. 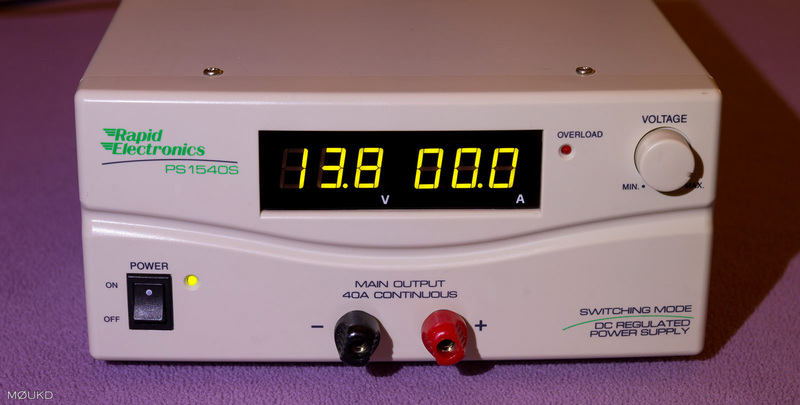 There are many different models, some with analog metering, some with digital and with maximum currents of 25A, 40A and 60A, but my review is based on the 40A model with digital display as above. Known ‘brands’ are Manson (of course), Sharman, Maas, Intek, K-PO, Rapid Electronics, Voltcraft, Powertech and I am sure there are some others. I bought this one to drive a solid state amplifier that required 13.8v. It has been happily powering all 3 of my transceivers at home for some time with no complaints. Sometimes I might be doing some HF data modes whilst also talking to locals on VHF with another transceiver, so it’s nice to have a supply that will happily do that with room to spare. 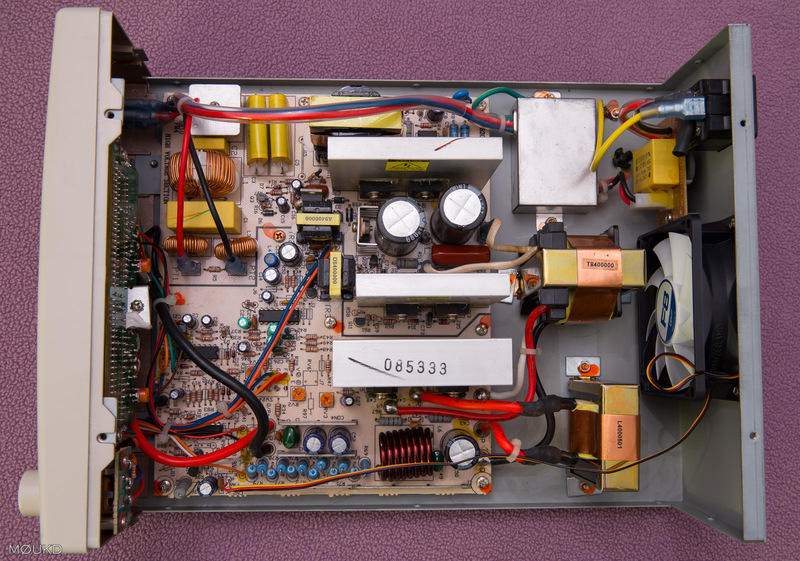 I have not came across any switching noise on the HF bands that I’m aware of, but with so many switch modes around the modern home, I don’t worry about using one for radio gear. I’m pretty sure this one is built far better than most of the others that you are likely to have floating around your or your neighbors home. 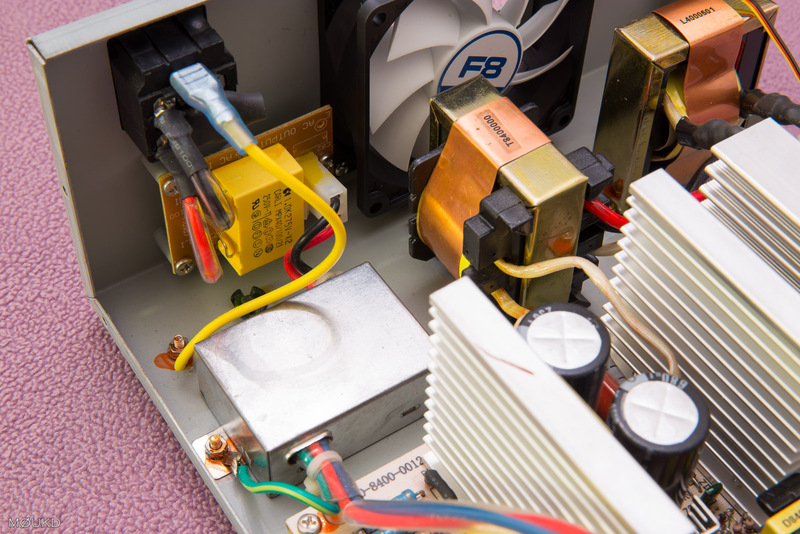 The only negative thing I can say about this power supply, is the fan. It is always on and although its not very loud, I would prefer something a bit quieter. I changed the fan in mine to a “silent” low RPM PC case fan (as can be seen in the photos) and it helped a lot. It’s quieter and still has adequate airflow, so this is no longer an issue for me. It’s a switch mode with good efficiency after all, so it does not really get warm. The unit appears very well built, with plenty of insulation on terminals and wires, neat wiring, dabs of shake proof paint on all screws and bolts and glue on all large components. 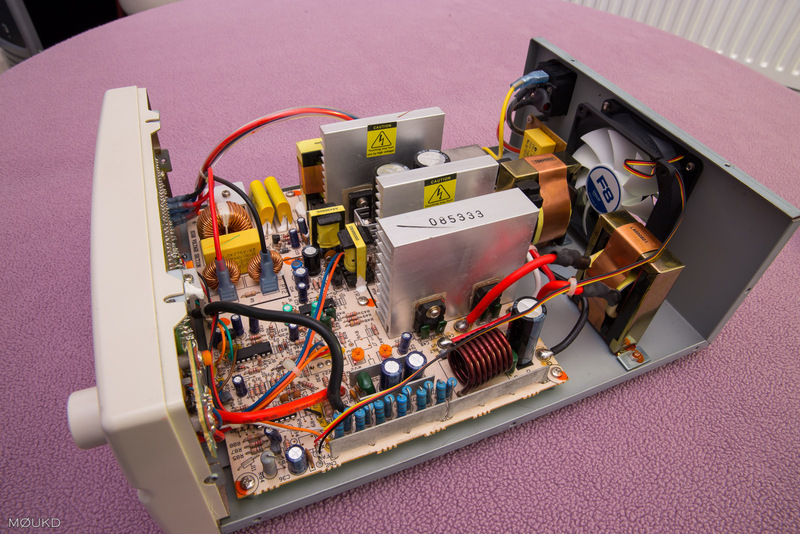 Plenty of mains input filtering can be seen between the mains input and the bridge rectifier, as well as a power factor correction circuit. 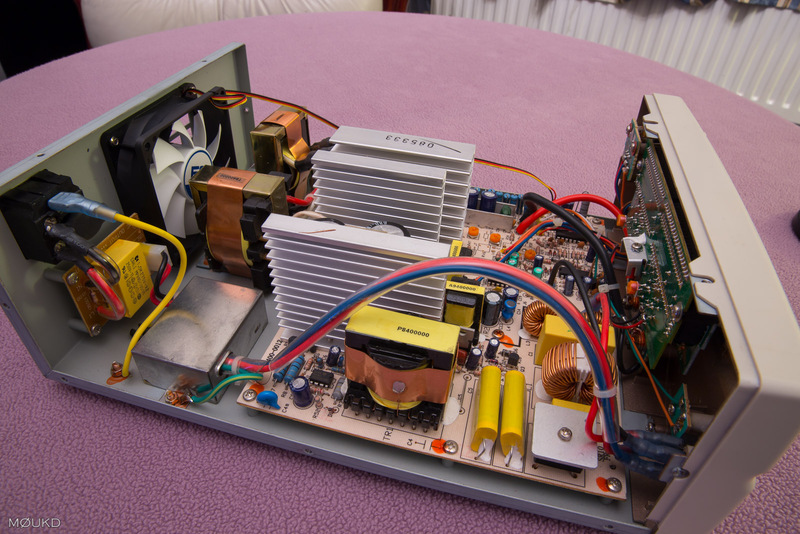 It certainly looks better than most switch mode power supplies. Input mains filtering and my replaced “silent” fan! More filtering can be seen on the output section. In the image below, the chassis mounted choke is 14μH and the air wound choke is 0.5μH. Both are rated to take the full 40A load. 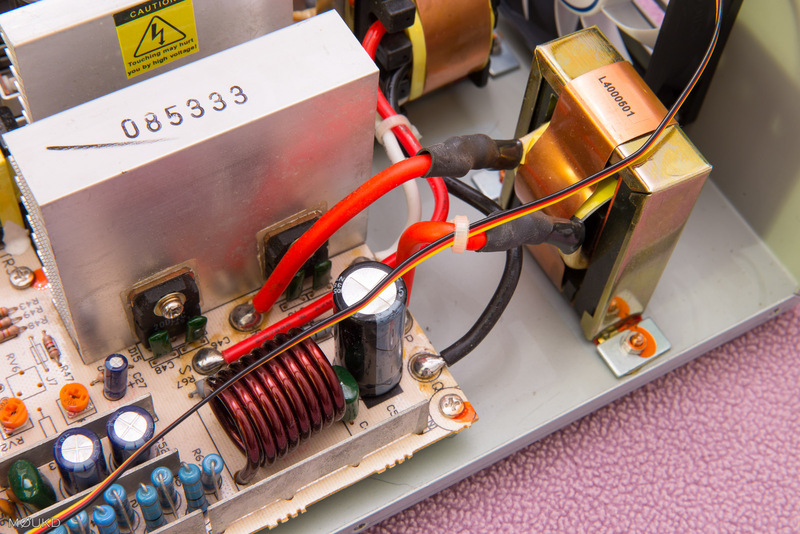 The power supply can be set to output a fixed 13.8v, or can be varied by the front panel control, between 3-15v. 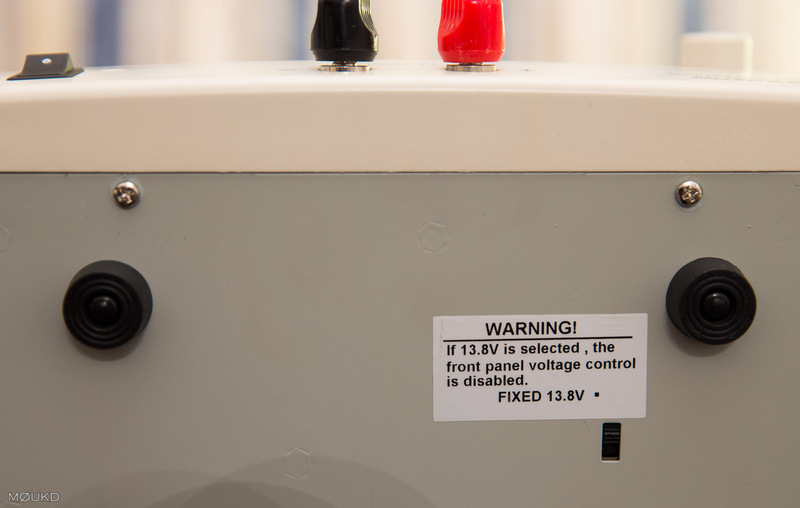 A recessed switch on the base selects constant or variable voltage. I have always left mine on fixed 13.8v, disabling the variable voltage pot on the front panel. 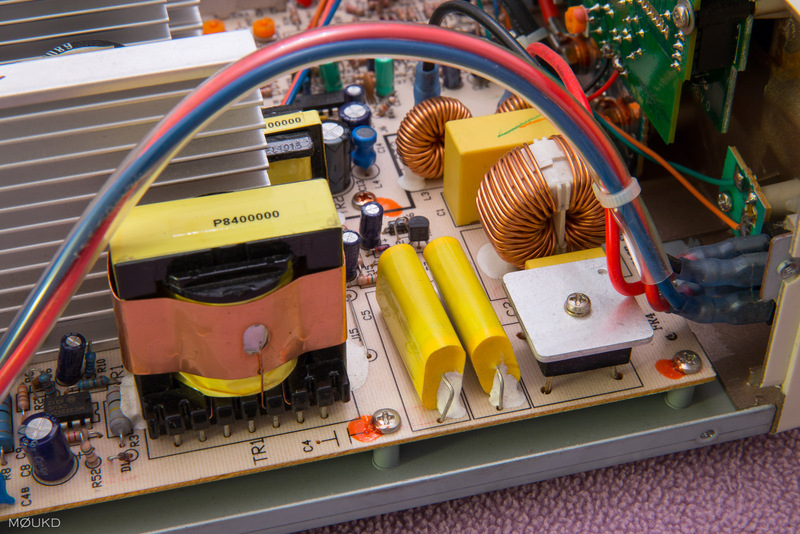 Preset ‘RV4’ on the PCB is for setting the fixed output voltage, should you wish to calibrate it. Not much to see on the rear of the supply. Dave at the EEVblog has done an in-depth video looking at this supply, although his is branded Powertech MP3090. You can see the video below. 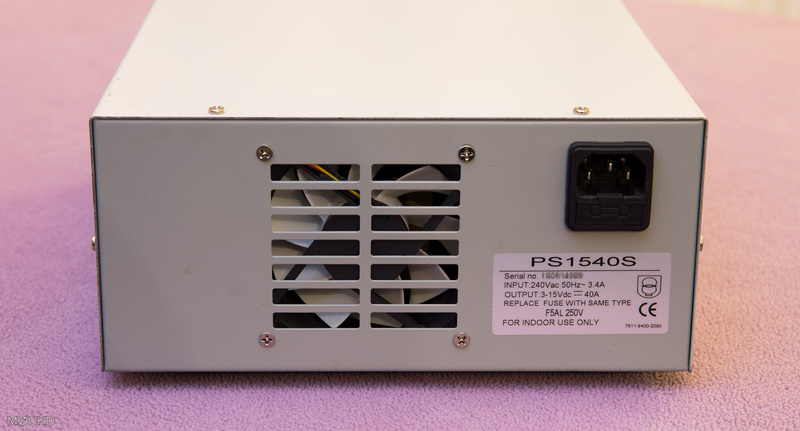 I would recommend this power supply, although I would suggest changing the fan to something quieter. Apart from that, it has been a solid performer and it even looks good!